Red Somdej LP Daeng, B.E.2513/2514. Delicate texture, specially made for the Committee (KammaKarn) who helped temple works only. Black Somdej LP Daeng, B.E. 2513/2514. The delicate texture specially made for the Committee. Yellow Somdej LP Daeng, B.E. 2513/2514, mixed with Gesorn (holy flowers). Please notice the backside of Somdej B.E. 2513/2514 using the 1st batch B.E.2503 medal Yant. The gray Somdej LP Daeng, Phim Tuen (Shallow Mold), please notice the red dot at the bottom most edge which means for the1st batch Somdej of B.E.2513/2514. Trickery merchants and dealers bought the 2nd batch items (mostly white or pale gray with shallow imprint) and mark a red dot at the same location to make it the 1st batch disguise. But some no-dot Somdejs with sharp and deeper imprint of this Phim may be luckily found--these are small amount of super Somdejs for temple's committee ( Kammakarn) or donors who indebtedly help much for the temple. This is the top splendid set of the first batch Somdejs of LP Daeng, Wat KaoBandai-it, Petchburi Province, B.E.2513/2514. Only a few collectors owned this great grand set...it's very...very...rare to find fantastic set like this. 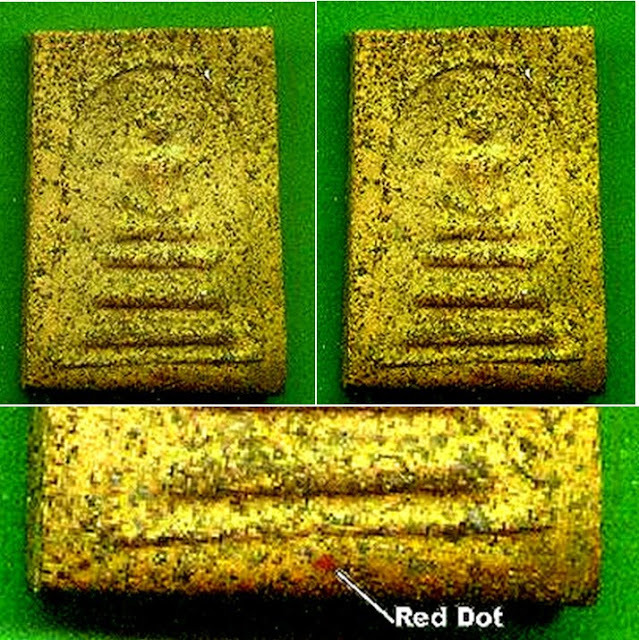 LP Daeng did not create only the red color Somdej but also other three different colors. The most expensive item is not the RED color but the BLACK one. The LP Daeng's Somdej set you have seen here specially made for the temple Committee and patrons who help so much for the temple. 1. The raw holy powder materials were blessed in more than 300 temples starting from the year before B.E.2507 until 2511. 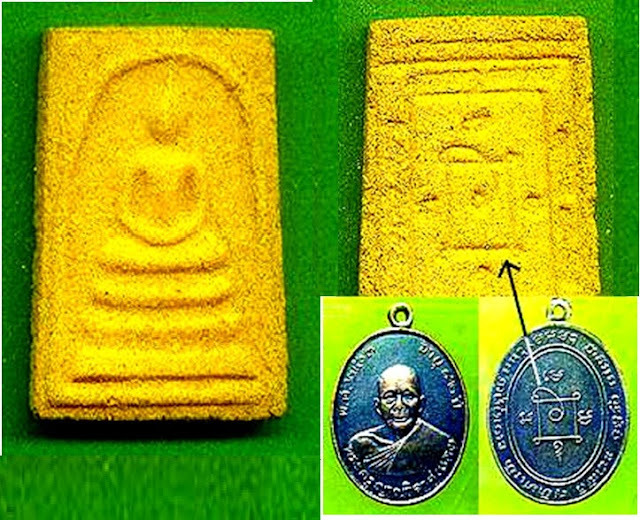 Then LP Daeng blessed the amulets 3 years from B.E.2511-2513 ( Finished blessing by LP Daeng in 2513. So it was called B.E.2513 batch). Then brought to be blessed 2 times by Dhan Chao Khun Nor on April 25, B.E.2513, and Dec 5, B.E.2513, at Wat Dhepsirin. And also brought to be blessed in these important blessing ceremony in Wat Yai ( Chinnaraj) 2514, Wat Nangphya B.E.2514, Wat Sothorn B.E.2514, Wat Doi Mae Pang (LP Waen) etc. 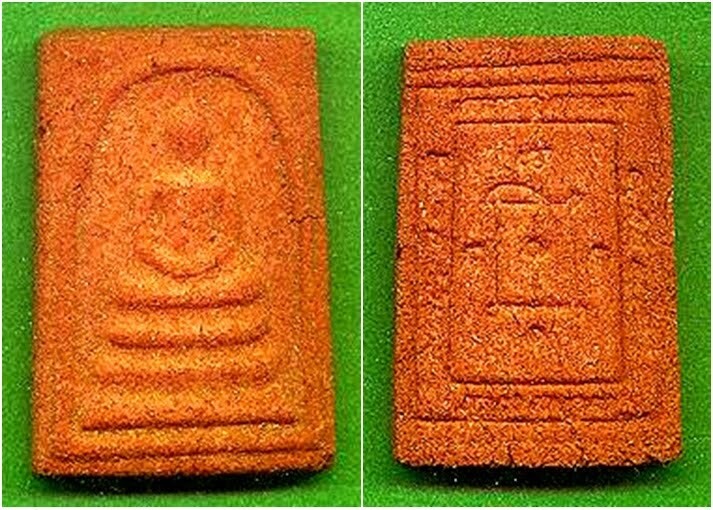 The amulets were first distributed on October 14, 2514 at Wat Kao Bandai-it. And it may be called B.E.2514 batch. SO THE AMULET OF THIS BATCH CAN BE CALLED B.E.2513 BATCH OR B.E.2514 BATCH. But some people call it B.E.2513/2514 Batch. They are all correct. f. holy water & holy candle wax from 109 temples, etc. The amulets help save many lives from road accidents. I received an impressive knowledge from corpse pickers that in the long years up until now they found no LP Daeng' Somdej wearers died on the road by car accidents. Another intereting story was an exciting event happened to a police parachutist of Narasuan camp at Hua Hin, PrachuabKirikhan Province, who jumped from a plane, his main and reserved parachutes were misfunctioned. He rapidly dived from the sky but the unexpectedly miraculous wind blew him far away, then he splashed down in the swamp. He wore only a LP Daeng's Somdej. Apart from that Petchburi in the past few decades was the bloodshed city, they used guns to judge conflicts. Many were gunned down by orders from the big bosses. LP Daeng Somdej and his B.E.2503 first Batch medal miraculously performed like bullet-proved jacket, the bullet could not get through flesh and bone. Many events and news widely spreaded out and went high up the sky rushing to Hong Kong. Hong Konger amulet enthusiasts and collectors fullheartedly paid a huge sum of money in exchange for LP Daeng's Somdej and medal. Many of movie giant Shaw's men stars at that time wore LP Daeng amulets on their necks. Has this amulet Metta and Fortune properties ? 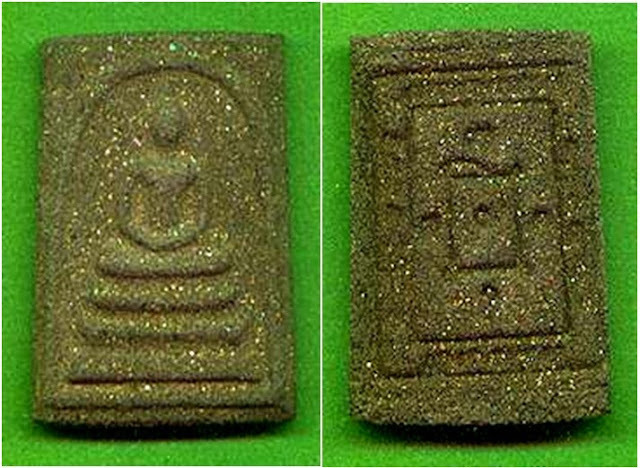 The answer is yes because the amulet texture was composed of Metta & Fortune powder from the top great amulets: ground broken amulets of Somedej Wat Rakang, Somdej BangKhun- Phrom. Wat Sampluen, Wat Indraviharn, Wat Ngern Klongtoey, etc. And LP Daeng blessed the amulets covering all properties. About 30 years of LP Daeng's Somdej thrilling experiences have proved their top efficacies on Klaew Klaad (free from all harms) and Kong KraphanChatri (invincibility). But please be careful, so many fakes in amulet markets both in Thailand and its neighboring countries--Malaysia and Singapore. Bring out the amulet from your neck and compare to those original authentic items here on the webpage, you will find the answer of Fake or Real by yourself.